Your tiles and grout get grimy with constant foot traffic. This result to a loss of sheen that could leave your home or office dirty-looking, which is a large downgrade as long as first impressions are concerned. To help keep your tiles spotless and well-maintained, here are some reasons why you need professional tile and grout cleaning services now. Regular measures may not work. While household measures such as regular mopping and scrubbing with a toothbrush seems to clean the grime off, they could not remove the deep-seated residues stuck in the grout. This leads to the constant accumulation of contaminants that can gradually degrade your tile flooring. Professional cleaners have appropriate equipment to get rid of residue and thoroughly clear the grout, making your floors look new. Your grout will not incur damages. Often in our attempt to make our tiles look cleaner and shinier, we are prompted to use cleaning products which may contain chemicals that can cause long-lasting damage to our tiles and grout. 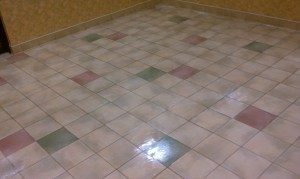 Cleaning professionals know which procedures to perform and products to use on your tiles to keep them in good condition without the threat of damages occurring. You’ll save time. If you have experienced manual cleaning of your tiles and grout first-hand, you know how tiresome it could be. A thorough cleaning of a spacious tiled room is back-breaking, in addition to the large amount of time it could consume; what more with a commercial company setting? To save yourself from the burden and time wastage, hire a professional team to clean your floors for you. Tile and grout cleaning for your pool improves its appearance.Swimming pools are a common sight in Florida yards. Proper cleaning and maintenance removes stains from your pool’s inner tiles and grout, giving it a fresher look. Professionals can give you post-maintenance advice. After cleaning, the professional team you’ve hired can give you tips to keep your tiles and grout clean for long. You’d have expert advice handy for your home’s best benefit! With professional cleaning, you can stop worrying about tile discoloration and grout accumulation and welcome a fresher and cleaner home. ServiceMaster 24/7 only employs the best efforts to ensure that you get the services you want. We have served Boca Raton, Boynton Beach, Deerfield Beach, Fort Lauderdale, and Pompano Beach areas. For emergency damage restoration and cleaning services in South Florida, call us at 954-969-5906 or message us here. PreviousPrevious post:Commercial and Residential Reconstruction & Restoration ServicesNextNext post:When should I Call a Professional Mold Remediation Company?